On a small hill farm in the Brecon Beacons National Park, Cadarn Bunkhouse is surrounded by fantastic landscape with views of the Black Mountains and the Wye Valley. With easy access to the mountains it is perfect for walking, mountain biking and horse riding whist the River Wye is perfect for kayaking and canoeing. The main bunkhouse has 7 first floor bunk rooms with three wash areas on the ground floor. A well equipped kitchen, dining room and recreation room with comfy sofas and a pool table are also available. 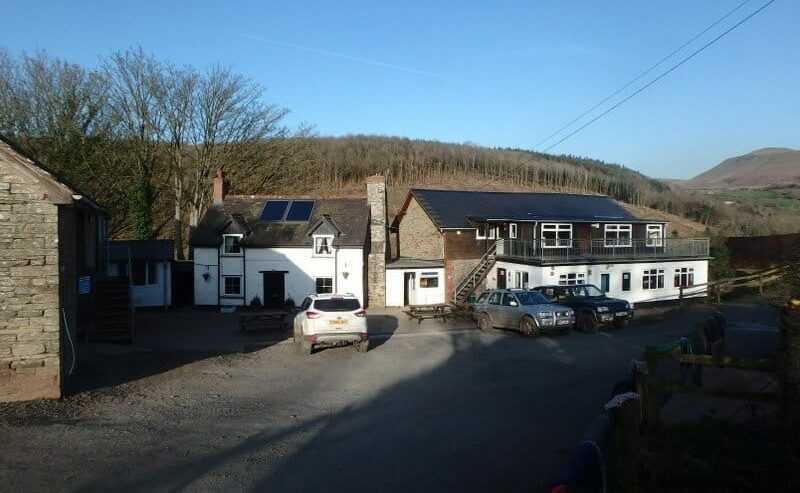 Self-cater or eat at the friendly pub in Felindre just half a mile away. The small bunkhouse has three rooms on the ground floor, its own bath/shower rooms and a small kitchen/dining/lounge area plus access to the decking to enjoy the amazing views. Close to Hay on Wye, famous for its bookshops and literary festival and Brecon a small market town which hosts an excellent Jazz festival. Horseriding and pony trekking available on site, bike hire can be arranged and delivered to you and canoe hire is also available. This accommodation is featured on our map of South Wales and Pembrokeshire and here is its own website. Phone or email to discuss your bunkhouse requirements. Sat Navs use LD3 0TB. In Felindre, turn by Three Horse Shoes pub, go past Tara B&B and up the hill, take first turn left onto gravel drive to bunkhouse. This accommodation is near mountains, is in a National Park, is available only to groups, has a pub within walking distance and is on the horse B&B page, the Brecon Beacons National Park and the Lon Las Cymru. Whenever we talk about Cadarn Bunkhouse, we talk about two things. We mention the glorious countryside and the riding stables. I suppose both go hand in hand as well. On the one hand, the riding would not be as popular as it is if it weren’t taking place from this secluded wooded farm near the Black Mountains and the Wye Valley. And on the other, there are few better ways to experience the landscape than mounted. There’s no other activity that matches the mix of athleticism and peace that riding can bring. 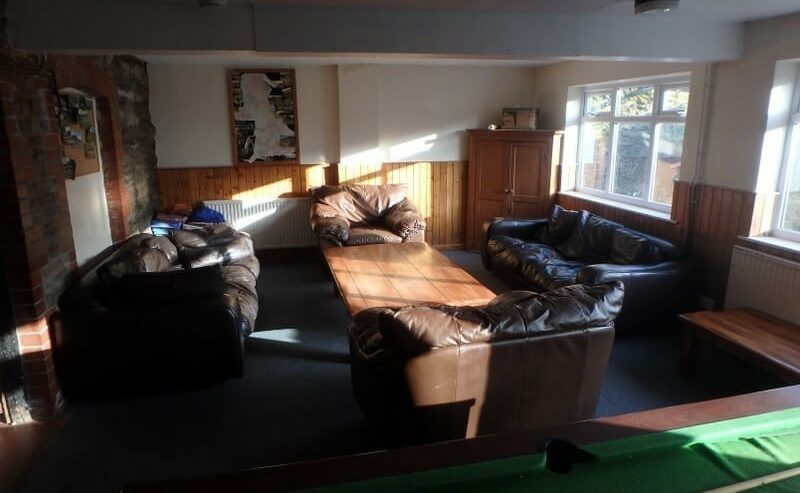 That’s why the bunkhouse is hugely popular with horse riders, in fact my wife swears she came here on a riding club trip from university – that would have been more than 20 years ago. With that much experience in accommodation and equine holidays, you can be sure of a fabulous experience at Cadarn. The bunkhouse is very traditional. It sleeps up to 48 in The Old Stables and The Tack Barn. Rest assured they’ve cleared out all the hay and saddles and what have you. Downstairs is kitchen/dining room with stone walls and beams above. The lounge features deep soft leather chairs and sofas that you’ll not want to get up from. Hay or Brecon? Literature or Jazz? Radio 4 or Radio 3? Cardarn Bunkhouse is a great base for high mountains and high-brow. Striding, pedalling, sailing or riding can be a contemplative set of pastimes. We, the outdoors-y type are also often thinkers, dreamers, creators. With this in our well-developed mind why not consider Cardarn Bunkhouse? 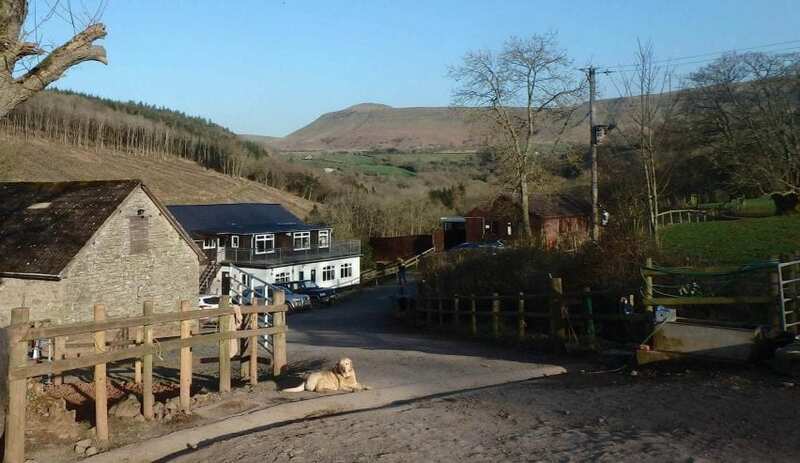 Nestled in a little valley on a hill farm in the Brecon Beacons National Park, Cadarn Bunkhouse is surrounded by lovely landscape with views of the Black Mountains and the Wye Valley. They house a riding stables and equine-themed holidays too – branded as Tregoyd mountain riders horse riding holidays! If you already know the area you’ll appreciate proximity to these mountains can be inspiring and vitalising. With easy access to both Hay-on-Wye and the town of Brecon, though, you’ve also found a base to experience their festivals. Hosting internationally renowned Literature and Arts and Jazz and music festivals respectively, Hay and Brecon are beacons for the high minded. Explore their websites. I’m sure something will peak your interest. Horse Riding Holiday in the Black Mountains with self catering bunkhouse accommodation at Cadarn Bunkhouse. Tregoyd Mountains Riders, who own Cadarn Bunkhouse, are specialists in horse riding holidays. Step out the bunkhouse door and the horses and ponies will be waiting for you ready for riding. The bunkhouse has 3 rooms each sleeping 3 people, self catering kitchen and dining area, shower room and lounge. Outside is decking with stunning views of the Black Mountains, the Wye Valley and the grazing horses and ponies. The Three Horse Shoes pub near by in Felindre serves excellent pub food. Typical costs of a riding holiday with Tregoyd Mountain Riders at Cadarn Bunkhouse are from £200 per person for two nights Self-Catering accommodation and two days riding with lunch.